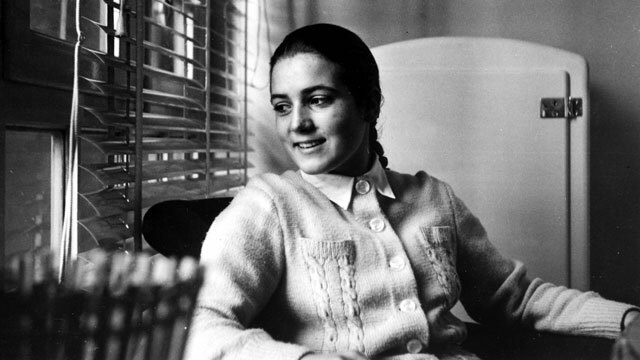 María Montserrat Grases García (“Montse”) was born in Barcelona on July 10th, 1941. She was the second of nine children born to Manuel Grases and Manolita García. After finishing high school, which she alternated with studying the piano, she began taking classes at the Professional School for Women, also in Barcelona. She liked sports, music and the traditional local dances, especially “sardanas.” She had many friends and enjoyed acting in plays. Her parents taught her to have a trusting relationship with God. At the Grases’ home, Montse developed many characteristics of her personality: cheerfulness, simplicity, forgetfulness of self and concern for the material and spiritual needs of others. With a few of her schoolmates, she would sometimes visit poorer areas of Barcelona and teach catechism classes to children, often bringing them little toys or candy. She had a lively and spontaneous temperament, and sometimes her reactions were a bit brusque, although her family and teachers recall that she tried to control her temper and to be friendly and welcoming to everyone. In 1954, she met Opus Dei, founded in 1928 by Saint Josemaria Escrivá to remind all Christians of their call to holiness in their family and work environment. Montse’s parents were already members of Opus Dei, and they helped her to strengthen her spiritual life and to strive to live the Christian virtues better each day. Manolita encouraged her daughter to visit a center of Opus Dei that offered classes to young girls about the faith and human virtues. Little by little, she realized that God was calling her to this path in the Church, and on December 24th, 1957, after reflecting on it in her prayer and asking for advice, she asked to be part of Opus Dei. From then on, she made a more concerted effort to achieve holiness in her daily life. In her spiritual struggle, she tried to put in first place the contemplation of Christ’s life, as well as Eucharistic piety, devotion to our Lady, a deep humility and a determination to serve others. Playing basketball or tennis also became opportunities for being generous with others. Montse strove to find God’s will in the fulfilment of her daily duties and in caring for small details out of love, and she spread to many of her friends and family members the peace that comes from living close to God. In December 1957, Montse began to experience pain in her left leg. Six months later, doctors discovered that this was being caused by a cancer (Ewing’s sarcoma) in her thigh bone. This disease caused Montse intense pain, which she accepted with serenity and fortitude. In spite of her sickness, she never lost her contagious cheerfulness or capacity for making friends, grounded in a deep love for souls. She brought many of her friends and classmates who went to visit her closer to God. In her pain, she found Jesus and Our Lady. Those closer to her witnessed her progressive union with God and the way in which she transformed her suffering into prayer and apostolate: in a word, into holiness. One of her friends says that when she saw Montse praying, she could sense Montse’s closeness to Christ. Montse died on March 26th, 1959, which was Holy Thursday that year, a few months before she would have turned 18. She was buried in the Sudoeste cementary in Barcelona. Many people have attested to her heroic and exemplary life. Since then, her reputation for holiness has continued to spread, not only in Spain but throughout the world. Since 1994, the mortal remains of Montse Grases are kept in the crypt of the oratory of the Bonaigua student residence on Jiménez i Iglesias Street in Barcelona. Many people go there to pray to her intercession and ask for help. A large number of favors and graces have been attributed to Montse’s intercession, many of them on behalf of young people who solicit Montse’s help in their needs. On May 15, 1992, the Congregation for the Causes of Saints declared the validity of the diocesan process. But in that same year they also decided to carry out a supplementary process of information gathering, among other reasons, to enrich the materials gathered in the 1960s. This additional process took place in Barcelona from June10 to October 28 in 1993. On January 21, 1994, the Congregation for the Causes of Saints decreed the validity of this second process. Romana, No. 62, January-June 2016, p. 137-141.